The strategy is based on working with the channel built by weighted average OHC and OLC prices. Entries are performed automatically both for a breakthrough and a roll-back. The EA works by a new bar open prices, so that test/optimization results are as close to real trading as possible. 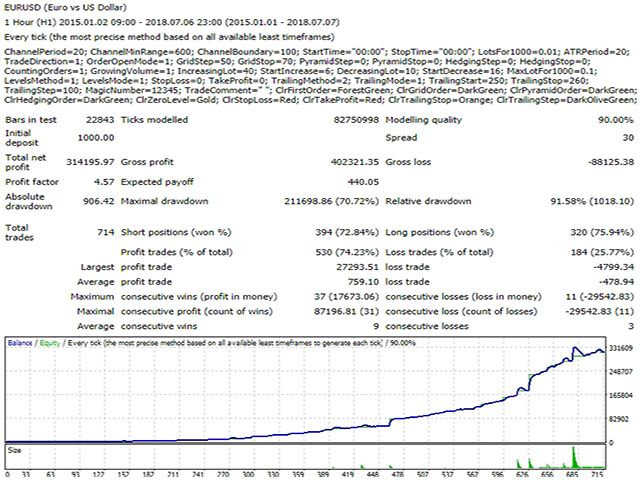 It applies dynamic levels for setting new orders, stop loss, take profit and trailing stop invisible for a broker. Their values can be calculated in pips, money, % of the balance or by volatility (ATR). The EA is designed for intraday trading with all major currency pairs on any timeframe. Depending on the settings, it can be used for any trading style: scalping, averaging, pyramiding, hedging, which makes it not just a trading robot, but a multifunctional flexible designer. Each block responsible for management of a particular function can be customized separately and operate as a single unit. The EA can simultaneously manage and close oppositely directed positions (both single ones and order baskets), as well as interact with positions opened manually or by another EA (start managing deals distinguished by magic number). Since the EA works at a bar opening, it can be optimized quickly and easily. ChannelBoundary - distance to channel borders to determine market entries.